Has your dream been to own a luxury yacht? Maybe 2019 is the year you finally fulfill that dream. Therefore, consider the M/Y X-ONE Falcon 90 luxury yacht. X-ONE was built in 2006 by the respected FALCON shipyard. 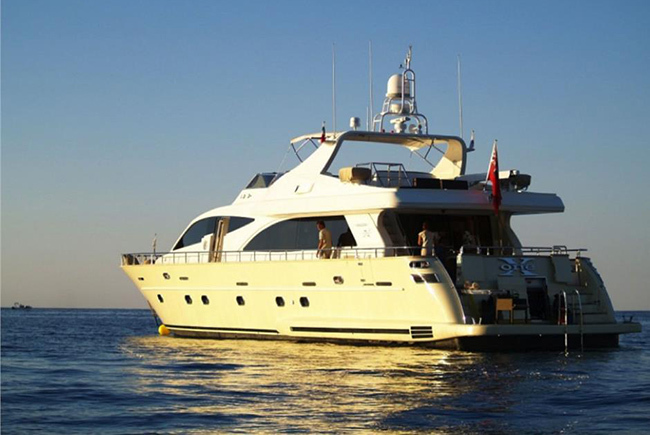 The yacht’s interior configuration has been designed to comfortably accommodate up to 8 guests overnight. In total, there are 4 cabins, comprising a master suite, 1 VIP stateroom, and 2 twin cabins. She is also capable of carrying up to 4 crew onboard. As a result, this ensures all guests receive a relaxed, luxury yacht experience. X-ONE is powered by 2 MTU 16V2000M91 engines, with only 1,250 total hours. X-ONE is capable of a top speed of 29 knots and comfortably cruises at 23 knots. She is available for viewing in Mandelieu la Napoule, France. Please not that all views are upon request. Mandelieu is just 40 minutes from Nice airport. The yacht has been carefully looked at and considered in superb condition. What we like is that engines have a low amount of hours. This key to prevent unwanted repairs. In addition, the X-ONE comes with Zero speed stabilizers. Asking Price for X-ONE s only €1.150.000 or approximately $1,341,000 (US)- Plus, the VAT is paid. So time to bring all offers! Sailing the open seas is both a relaxing and energizing experience. The clean air and ocean spray is very enjoyable. If you are interested in learning more about owing a luxury yacht of your own, please contact us today. We will gladly provide addition details. If you are ready to own a luxury yacht like the M/Y X-ONE Falcon 90, let us know. Stop by and follow our luxury blog. We enjoy sharing the best in luxury industry news.